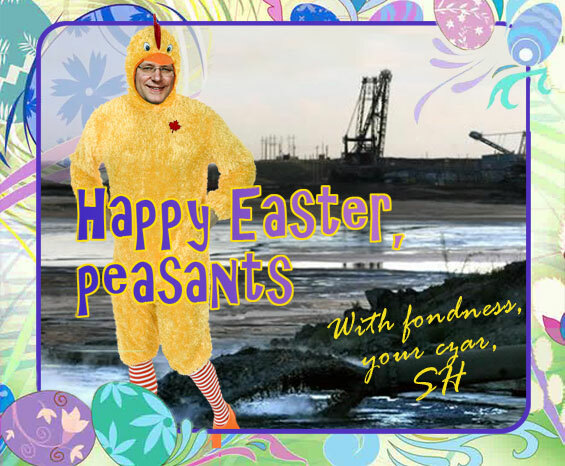 As in years of yore, I've scanned in the Prime Minister's annual Easter card so Canadians who happen to be out of the country or who didn't receive their greeting before the holiday can see what Stephen's up to. This Easter Prime Minister Harper will be on-site at the Alberta Tar Sands handing out Easter chocolates to animals whose habitat has been destroyed by the Tar Sands and the numerous children worldwide whose futures have been put in jeopardy by the plundering of our environment. Just look for the Syncrude signage if you want to know where to go to collect your free chocolate. There will also be a hunt for Canadian democracy (likely lying at the bottom of a toxic tailing pond) and Tar Sands Easter decorating competition. So you gotta know that will be a wicked fun time! Get your pastel paints and scuba gear ready. * CAUTION: The Government of Canada and Syncrude are not responsible for death, dismemberment or illness suffered in conjunction with this offer. Additional Harper greeting cards, action figures, and promotional photos available here.